The project entitled “The Revival and Revitalization of the Rikard Benčić Block in Rijeka” included the revitalization of the former industrial complex “Rikard Benčić” and the reconstruction of objects within the complex for public cultural and educational purposes with the ultimate result of creating a cultural district in the center of Rijeka. T-building with a gross area of 5.750 m2 will be house a new city library. The building is located in the northern part of the “Rikard Benčić” former industrial complex in the City of Rijeka. A foundation design was made, based on the geotechnical report. 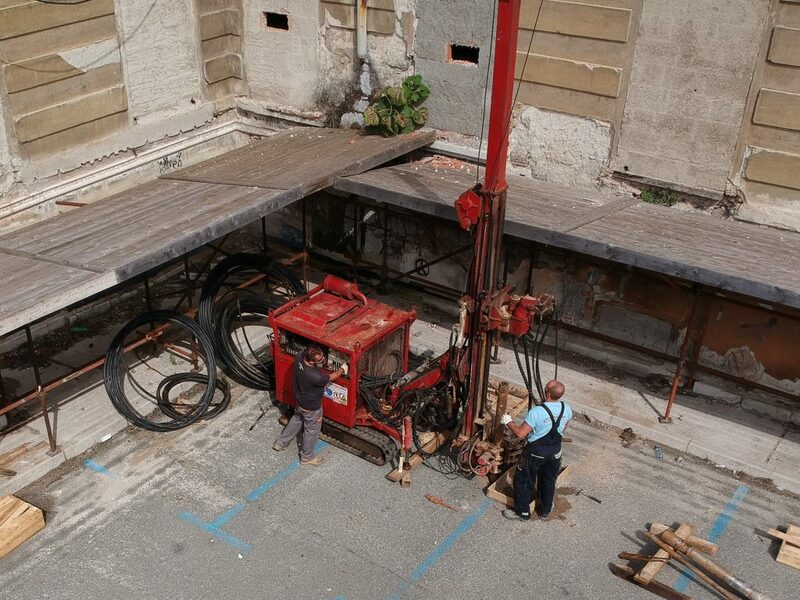 For the needs of the City Library of Rijeka, it was necessary to carry out the remediation of the foundation structure of the existing part and new deep foundation for the toe of the T-building. In the position of external walls foundations, jet grouted columns in pairs are foreseen (diameter D = 700.0 mm and length L = 11.0 and 14.0 m), while in the center position four jet grouted columns are foreseen (diameter D = 500.0 mm and length L = 13.0 m).